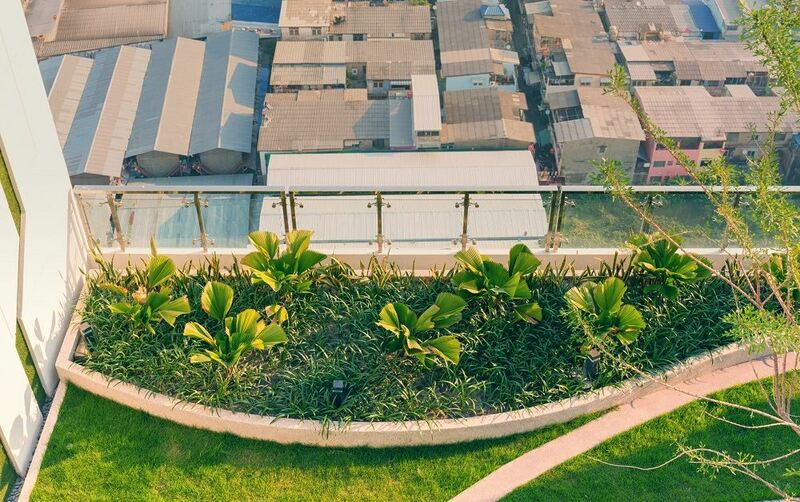 Takeaway: ​With nearly half of all humans living in urban areas, and many cities beginning to amend their codes and regulations to allow the construction of roof gardens, people around the world are warming up to the idea of creating outdoor oases on their rooftops. Though perhaps in its infancy in many North American locales, rooftop growing is a well-developed practice elsewhere. In India and Singapore, tiny, high-tech rooftop farms in the range of 50 square meters provide profitable jobs for housewives and retired workers. Roofs can be ideal for hydroponic growing, too. Some mini-farms are now so high-tech that one acre can produce 700 tons of produce using aeroponic methods. Each year, more rooftop growers who have basic green roofs advance to productive commercial-size operations like this. The simplest roof gardens feature pots and containers. Balconies and other small spaces allow for garden towers or bees and chickens. Sloped roofs are still an open for living turf, though this super low-tech option is best suited to small outbuildings these days as it’s possible some modern homes couldn’t support the weight of thick turf. Alternatively, there are also living roofs, which are extensive areas of growing media less than 15 centimeters deep and planted with sedums, succulents, and hardy native plants. Such a living roof will add less than 50 pounds per square foot to the roof’s weight. A crop roof, on the other hand, is an intensive production zone with deeper growth medium, and it will add 80 to 120 pounds per square foot. If you have difficulty getting the media deep enough for crops directly on the roof, planting boxes can easily be constructed. Some tropical hardwoods and oily woods, like redwood and cedar, contain aromatic oils that resist rot. Longer lasting boxes can be built with synthetic materials or with a wood frame and corrugated metal liners. Whatever you decide, though, nix toxic treated lumber around food plants. One low-tech, low-cost growing space for shallow-root plants is manufactured roof troughs (AKA gutters). Buy 10-foot lengths with end caps, long support nails, and hollow ferules that keep those nails in place for mounting. A planted roof provides forage for small wildlife, birds, and insects. Native plants feed native insects and birds. Large areas of plantings contribute to fresher air and CO2 absorption. Plus, a roof is up out of reach from animals and troublemakers. A living roof lasts many decades when done right—65 years or longer. The sun’s high-energy ultraviolet (UV) rays break molecular bonds and destroy building materials fast. Living roofs prevent UV from reaching the waterproof layer. Plus, not having to rip off, dispose of, and replace a roof every 15 or 20 years saves an immense amount of money, energy, and materials over the life of the structure. Soil or planting mix dampens sound and provides good insulation. Plants give shade and, when they transpire, cool by evaporation. This reduces the urban heat island effect that contributes to making town centers hotter than surrounding areas. Thus, a living roof helps limit the advance of climate change and plays an integral role in sustainable design. It’s sunny up high where there is less shade. Most crops, from zucchini to asparagus, demand hours of daily sunlight to mature. In a city, the top of a building may be the one available place that’s not shaded for much of the day by tall structures. In a forested area, a roof might be the largest sunny spot around. Heavy flows of storm run-off, excluded from sewage treatment, pick up urban pollutants when water rushes over hard, contaminated surfaces to flood streets before it drains to streams. A living roof allows storm water to be absorbed where soil organisms can break down toxins and the outflow drains away gradually. 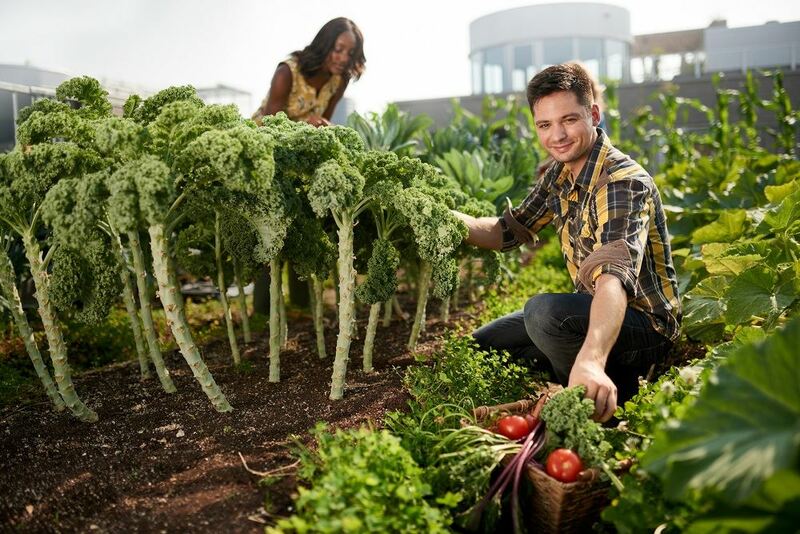 In big cities, where space is at a premium, rooftop gardens are coveted getaway spots, attractive to potential renters as a social spot or spirit-building retreat. Winds are fiercer up high and can rip away your work. The sun may be so intense you need shading. It’s tough to carry everything up there and haul produce back down. As with any garden, somebody must pay for water, seeds and starts, amendments, support structures, etc. and it requires commitment to regular care and maintenance. Despite some manageable drawbacks, any nearly flat roof can be gardened. Also, there’s no best way to go about it. Each good solution is unique to your goals and the local situation. Whatever you decide to do, start with a budget. Then check building codes and local laws. Seek out those who have roof gardens near you for valuable advice and a chance to see what’s working. Read a lot. The best book out there is The Rooftop Growing Guide by Annie Novak. Get clear about what you want to achieve. Scale drawings provide a reality check and help others envision your ideas. If you don’t own the rooftop, have interested parties—owners, managers, and tenants—buy in. Including an outdoor relaxing area gives non-gardeners a stake in the project. Talk about your plans. Present your drawings and budgets. Offer assurances or signed agreements. A damaged building really kills your budget. Have a knowledgeable person check the structure beneath the roof. The lowest-risk area to add weight to is near perimeter walls. There, forces transfer straight down through walls with high compression strength. Check engineering tables for density of different materials. Soil is heavy. A two-square-meter bed with growing medium 25 centimeters deep weighs between 600 and 850 kilograms. To lighten, loosen, and increase water-holding of any grow mix, add up to half perlite or vermiculite. Study your mix options to select the right one for your project. The essential waterproof layer is also a plant barrier, protecting the structure from determined roots. Heavy-duty black pond liner and thermoplastic membrane products two options. Use quality materials. Compromises will cost you. Also, a soft layer of acoustic insulation placed below it reduces damage from boots and tools. Whether planting all over or in grow boxes, you need to drain off rain, melt, and irrigation water. However, you don’t want to lose your soil or growing media. A raised rim at the upper edge and sides of your sloped rooftop garden prevents soil loss. The lower edge is trickier. To contain the soil on the bottom edge, some simple designs include a built up or spread out barrier of gravel or rocks. We used commercial-grade landscape cloth over the rim of treated lumber. This creates an edge-strainer that allows excess water to escape under the soil-holding rim of treated lumber. If you want to go automated, go for buried drip systems, perforated hoses, or, for the ambitious, a computer-controlled precision method. Overhead spray systems, on the other hand, are inefficient at getting water to roots. While handwatering isn’t automated, but it has the advantage of allowing you the time to observe your plants more closely so you catch problems early. You’ve talked with people who know, checked out a number of books, websites, and other resources for design ideas. You’ve done all the prep and preliminaries to get the roof ready, have your plans drawn and approved, borrowed a truck, and have a crane or friends lined up to carry stuff. You’ve chosen the grow mix and gotten starter plants and seeds. Now, it’s time for action. Have fun!